This blog has welcomed Education Secretary Michael Gove's recent revival of the sponsor academies programme. But a big challenge this presents is finding sufficient sponsors. One sector that has not yet been tapped to its full potential is the network of trusts that run our 'public schools'. In a remarkable lecture to the Specialist Schools and Academies Trust last night, Andrew Adonis laid down the gauntlet to the private sector with an unanswerable argument based on these trusts' own missions. As Gove has also spoken recently about his wish to see more private school academy sponsors, the challenge now is how to realise this vision. But as it is a hugely important contribution to the debate, I thought it worth reprinting Andrew's lecture on this blog. There is no point being in public life unless you seek, as honestly as you can, to address the big problems facing the country and make a stand for policies you genuinely believe will make society better, free from outdated dogma. This is the lesson I learned from my two political mentors, Roy Jenkins and Tony Blair, with both of whom I worked closely and admired greatly, not only for their political skills but for their enduring values and their courage as progressive reformers and leaders. Tony Blair’s motto was “the best policy is the best politics,” and I can’t think of a better one. So forgive me if I am not all motherhood-and-apple-pie this evening. I want, if I may, to tackle two of the biggest challenges which face us in education today. The first challenge is not simply to reduce the number of underperforming comprehensives – where we have made reasonable progress in the last decade – but to eradicate them entirely, replacing them with successful all-ability academies. The second challenge is to forge a new settlement between state and private education in England. I put these two challenges together because they go together. It is my view, after 20 years of engagement with schools of all types, that England will never have a truly world class education system until state and private schools are part of a common national endeavour to develop the talents of all young people to the full and build a “one nation” society instead of the “them and us” of the past. My experience as a reformer has also taught me that almost all the best solutions to big challenges are simple. Complexity comes in trying to avoid or qualify the simple solution because it is unpalatable. You of course need to be simple and right, not simple and wrong; and a good deal of research and experience – and where appropriate, piloting of policy – needs to go into getting to the right simple solution. Simple doesn’t mean simplistic. Nor does simple mean easy. It means getting to the heart of the problem, and making the fundamental change which makes a fundamental difference. So just as the challenge is simple – how to unite state and private schools in a common endeavour – I believe the solution is also simple. Every successful private school, and private school foundation, should sponsor an academy or academies, in place of existing underperforming comprehensives. They should do this alongside their existing fee-paying school or schools, turning themselves into federations of private and state schools, following the lead of a growing number of private schools and their foundations which have done precisely this and would not think of going back, including Dulwich, Wellington, the Haberdashers, the Mercers, the Girls Day School Trust, the City of London Corporation and the King Edward VI Foundation in Birmingham. And by sponsoring academies I don’t just mean advice and assistance, the loan of playing fields and the odd teacher, etc. I mean the private school or foundation taking complete responsibility for the governance and leadership of an academy or academies, and staking their reputation on their success as they currently do on the success of their fee-paying schools. For the private sector, I set this totally apart from the opening up of more places in existing private schools to those who can’t pay the fees. This is a good thing for private schools to do to make themselves less socially exclusive, but it does nothing to create more good schools, let alone to breach the educational Berlin Wall between private and state education. To leaders in the state sector, I put this forward as a complementary – not an alternative – policy to the brilliant job that so many successful state school leaders and organisations are doing in establishing academies. We need many more good academy sponsors from all successful parts of the education system – state schools, private schools, universities, and educational foundations – and we need them to learn from each other and collaborate. I want to develop the argument for this new state-private settlement in some depth, because the forces against progress are deeply entrenched in both the state and the private sectors of education, mirroring prejudices on the Left and Right of politics which go back decades if not generations. Over the entire second half of the 20th century, these prejudices made it exceptionally hard to do more than fiddle around at the margins of state-private partnership. This, in turn, bred a deep fatalism which is with us still. Everyone knows that the status quo is terrible – rigid separation between most of the nation’s most privileged and powerful schools and the rest. Yet no-one has a credible plan or will to do much about it except say how bad it is, why it’s someone else’s fault, and why it will never change because, well, this is England, it’s deep and cultural, and it all began with Henry VIII. It’s the same fatalism which greeted gridlock in central London before the congestion charge, hospital waiting lists before patients’ rights, and rain stopping play at Wimbledon before the roof. The call now is for activists not fatalists. The future doesn’t have to be like the past. There is no reason whatever why the Berlin Wall between the state and private sectors of English education cannot be brought down fairly quickly, if every private school and private school foundation sponsors an academy or academies, running independent schools in the state-funded as well as the fee-paying sectors, immersed in promoting excellent education for the least well-off as well as the best-off in society, and progressively combining the best of both. To develop the argument, let me say more at the outset about underperforming comprehensives on the one hand, and private education on the other, before addressing the fundamental relationship between the two. On underperforming schools, we still have far too many of them. Where they are not improving rapidly, every year, they should be replaced by academies. My ambition from the moment that academies started to prove themselves successful was to replace the entire bottom half of the comprehensive system with academies, unless the schools were improving rapidly. I didn’t put it quite like this at the time, not wanting to be burned in effigy by my admirers in the Anti-Academies Alliance even more frequently outside Sanctuary Buildings, but I don’t think my direction of travel was much of a secret. By academies, I of course mean “sponsored academies.” The whole purpose of academies, in respect of underperforming schools, is completely to replace existing governance and local authority control with new independent sponsors, untainted by past failure, who demonstrates the capacity and ambition to create excellent all-ability schools. For this, a large number of outstanding sponsors are needed, able to manage perhaps a thousand more secondary academies. I also welcome Liz Sidwell’s appointment as Schools Commissioner to help bring this about. 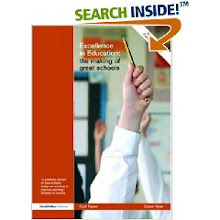 From her years leading the Haberdashers’ academy federation, no-one knows better than Liz how to bring sponsored academies into being, and how to harness their potential to drive the fundamental reinvention of secondary education in areas where comprehensives have basically failed in the past. She also knows a thing or two from the Haberdashers about state/private partnership in academies. This is a moral cause. But it is also an economic imperative. As Michael Gove also pointed out, 80 per cent of students in Singapore already get above a similar threshold of five O levels including English and maths (they still sit Cambridge board O levels in Singapore). It was visits to schools in Singapore, Finland, Taiwan and Hong Kong in 2007, where I saw not only near uniformly high standards but also a relentless drive to raise them still further, that transformed my thinking on the scale of the task we face in England. I gave a lecture shortly afterwards suggesting that we needed by 2020 to become an “80 per cent” education system – by which I meant at least 80 per cent of 16 year-olds reaching a basic baccalaureate standard. At the moment we are at just over 50 per cent. But we can’t really wait until 2020 to be as good as Singapore and Finland today, so it is not incremental change but step change that is needed. I say this in full recognition of the great progress that has been made in recent years by headteachers and teachers nationwide, all the more impressive when one considers the state of the education system only a generation ago. Fifteen years ago, a staggering half – half – of all comprehensives weren’t even getting a third of their pupils above the five good GCSE level including English and maths. This wasn’t entirely surprising when two-thirds of 11 year-olds, in the first national SATs tests in 1995, were found not to be reaching an adequate standard in the three Rs. I still shudder to think of my visit to a comprehensive in Sunderland a few years ago where the previous summer only fifteen 16-year-olds had got to the five good GCSE level including English and maths, and a local authority official said to me: “Lord Adonis, you need to understand that they used to leave here, go down the hill, and turn left to go into the shipyards, or turn right to go down the mines, but now there aren’t any jobs so they might as well walk straight into the sea.” That school is now closed and replaced by an academy sponsored by the University of Sunderland and a local hi-tech company. It was on visits like this that I also came to understand why things were so bad, because of the secondary-modern antecedents of so many comprehensives, including that one. When people talked of the comprehensive revolution, this was in fact a misnomer. Across most of the country there was no comprehensive revolution, just a continuation of the secondary moderns. In the early 1960s there were 3,700 secondary moderns and only 1,200 grammar schools. One way and another more than a quarter of the grammar schools stood apart from the comprehensive reform, including most of the most prestigious and successful grammar schools which went private rather than be abolished. So across most of the country, comprehensives were simply the former secondary moderns with a new sign outside, and a few prefab buildings or portacabins to accommodate the raising of the school leaving age to 16 in 1972. Only one member of staff felt strongly that even the best boys, in the top stream, were of sufficient ability to take O-level; most of the other teachers of the higher streams took the view that ... to enter them for O-level would be to mislead the pupils with hopes of academic success beyond their powers. There is also little doubt that some of these teachers were reluctant to teach to O-level since they had never done so and were uneasy about their competence to do so. As for the wider ethos of the school: Lessons and exams were treated with contempt by most of the boys. ... For many of the teachers and most of the pupils life at the school was a necessary evil. Life was directed towards a reduction of potential conflict by a minimal imposition of demands one upon the other. If the upper streams passed their [school leaving] exam and the lower streams did not riot, the school was for most teachers succeeding.By this yardstick, even the worst comprehensives in the 1990s were an improvement. Understanding the past made me all the more alive to the immensity of the challenge to overcome it, a challenge of community transformation as much as educational reform. But it also made – and makes – me all the more radical in seeking solutions which measure up to the immensity of the challenge. Hence academies. So we are making progress, but there is so much further to go. For example, half of the city of Birmingham’s 75 secondary schools – half – are still not achieving five good GCSEs including English and maths for half their pupils. Birmingham boasts some of the best private and state schools in the country, yet it still has a long tail of seriously underperforming schools. It should be no surprise that Birmingham’s unemployment is twice the national average; that its workforce skill levels are among the lowest in the country; and that it still only has seven sponsored academies open or in the pipeline. And I could tell a similar story about many other parts of the country. Now let me turn to the private sector. The debate about private education in England encompasses two different private sectors. There is the private profit-making sector. And there is the private charitable sector. There is a growing debate as to whether we should follow Sweden and parts of the United States, among others, and allow private profit-making companies to run state-funded schools. I am opposed to this. When Minister, I said to the private profit-making companies wanting to set up in England that they should sponsor academies philanthropically, and if they could demonstrate great success, then they might be able to make a case. None has yet done so. It is true that in the much-cited case of Sweden, commercial operators have been a major force behind free schools. But I would make two comments about this. First, the experience has been problematic. Sweden has faced a number of recent scandals around profit-taking from commercially-run state funded schools. The Swedish education minister recently announced an enquiry into how free schools which fail to meet accepted standards can be prevented from taking out profits. Secondly, the position in England is fundamentally different. When Sweden embarked on free schools, it had a weak private charitable school sector. England, by contrast, has one of the largest, and possibly the very strongest private charitable school sector in the world. Both of our major churches are large-scale school sponsors, in the private and the state sectors; and the great majority of our private schools – and all of the historic private school foundations which dominate the private school elite – are historic charities. The private sector which can make a big difference to English state education isn’t the private commercial sector but the private charitable sector. We need to focus on the whale not the minnow. Let’s look first at the statistics. Dwell not on the seven per cent of school age pupils who go to private schools, which is the most misleading of the stats. More revealing is the 18 per cent of full-time students over the age of 16 who are at private schools. The one in three of A grades in A-level physics, chemistry and history which go to private school students, earning them a similar proportion of places in most Russell Group universities and half of all places at Oxford and Cambridge. Stop there for a moment: that’s 8,000 ex-private school students at Oxbridge, compared to a mere 130 students at Oxbridge who, at school, were eligible for free school meals. So 130 Oxbridge students are drawn from the poorest 13% of secondary school pupils, while 8,000 – sixty times as many – are drawn from the most privileged seven per cent. No surprise then, those Sutton Trust reports which tell us that three in four judges, two in three top barristers, and half of leading company chief executives, solicitors, journalists and politicians were educated at private schools. Sport, drama, TV, and both pop and classical music are also largely dominated by the private schools. England in 2011 is governed by a Prime Minister educated at Eton, a Deputy Prime Minister from Westminster, a Chancellor from St Paul’s. Charterhouse, Rugby, Radley, Wellington and Cheltenham Ladies College are all in the Cabinet too, along with a second from Westminster; almost all of them children of very wealthy parents. We do indeed have a coalition government – a coalition between Eton and Westminster. It is only a slightly broader coalition which funds, manages and entertains the country too. Seen in this way – the dominance of a privately educated elite over the social, economic and political life of this country – you realise why it is so important, if we are ever to be one nation, to have the people who run the private schools, and who teach in and attend these schools, engaged institutionally with intimately with state education too. Let me also say a word about the teaching profession. Back in the 1970s, the pupil:teacher ratio in private schools wasn’t much different than in state schools. Now, on the back of fees which have doubled in real terms in a little over twenty years, the private school ratio is about half that in state schools. 14 per cent of the nation’s teachers are in private schools, and a far higher proportion of teachers with better and higher degrees. Moreover, a recent report by the Centre for the Economics of Education notes that by far the single largest source of new teachers in private schools is experienced teachers in state schools, whereas traffic the other way is minimal. To put this in perspective, the excellent Teach First scheme, which as a Minister I did everything in my power to promote (including signing very large cheques) because of its significance in strengthening the link between the top universities and the state teaching profession, will this year recruit 800 graduates into state schools. A great achievement. Yet according to Centre for the Economics of Education data for 2006, there was a net recruitment – after transfers the other way – of 1,400 experienced teachers from state schools into private schools in that year alone. How did it all come to be like this? Like the secondary modern antecedents of the comprehensives, the Victorian antecedents of today’s private schools are highly illuminating. Historians of education talk a lot about Gladstone’s 1870 Education Act, which essentially started state education. But equally significant were Gladstone’s 1869 and 1873 Endowed Schools Acts, which essentially turned the great public schools – and many of the newer grammar schools – previously run in a rackety way by Crown, church or local appointees, into a Victorian equivalent of academies, with new independent governing foundations to control their assets, management and leadership. This Victorian academy status greatly strengthened the private schools as institutions, but their fees, and the conservative use of their charitable assets by their new governing bodies, kept most of them largely closed to all but the upper and upper middle classes, and they remained so as the state secondary system developed in the decades after the 1902 Balfour Education Act. But it didn’t happen. Sixty-six years after the war, the only significant changes to the private school system are that it is larger, richer, and its average educational attainment has risen to among the highest in the world. This is because during the whole period since the war, Labour and Tory governments alike have adopted a simple one word policy in respect of private schools: isolationism. On the Labour side, ideological antipathy to fee-paying education, and later also to selective education, bred hostility. But the social and legal position of the private schools, plus – ironically – the personal educational preferences of Labour leaders from Attlee to Wilson, kept at bay any attack beyond the rhetorical, except for the withdrawal of state funding schemes for small numbers of pupils to attend private schools, which the 1974 Labour government did in respect of the direct-grant scheme introduced by Butler in 1944, and the 1997 Labour government did in respect of the Assisted Places Scheme introduced by Margaret Thatcher in 1980. Under Tony Blair – Durham Cathedral School, Fettes, St John’s College Oxford – any undermining of the private schools was equally out of the question. Instead there was friendly waffle about mutual respect; and some committees and minor partnership projects which did not a lot. That is, until academies, of which more hereafter. On the Tory side, there was an equal and opposite isolationism. Partly this was a matter of letting sleeping dogs lie. Most Tory ministers and MPs went to private schools and sent their children to them. So long as Labour kept the dogs off, they had no desire to court controversy by proposing any expanded role for the private sector. On the Tory left, epitomised by the Etonian Sir Edward Boyle, education minister under Macmillan and Douglas-Home, two more Etonians, there was also a dose of patrician guilt and support for comprehensivisation, provided it didn’t affect the private schools. However, for the Tory mainstream, the major concern was about dilution. The dominant view was “more means worse”: the view that there were only a small, and pretty fixed, number of “good” schools, mostly existing private schools and the remaining grammar schools, and they needed to be preserved in aspic. This secured, the only safe and politically viable Tory reform in respect of private schools was to open up a tiny number of places in private day schools to children with poorer parents. Hence the assisted places scheme which with much fanfare paid private school fees for 30,000 children out of a private school sector of 500,000 children and a state school sector of more than 8 million. Not so much an education policy as escapology. So much for the politicians. The leaders of state and private schools were – and many of them remain – similarly isolationist. It was an article of faith among the leaders of the comprehensive movement that private schools were not only socially divisive but also, in respect of educational practice, largely irrelevant. This remains a pronounced view, even among some of my friends who run academies. They say, to paraphrase: “what can that lot who just spoon feed the children of the rich ever know about education in Hackney and Knowsley.” As for the heads of the private schools, many of them have been only too eager to agree, when the suggestion is made that they might manage state-funded academies. Pressed further, they often say it’s not about ordinary children versus privileged children but about non-selective schools versus selective schools, a view put to me recently by the chair of governors of one of our great public boarding schools, which I found richly ironic, given that until recently his school was basically an all-ability comprehensive for the rich and titled. This mutual isolationism didn’t matter much until now, because there was no opportunity for systematic and deep engagement between the two sectors. Now it matters a lot, because before us, if we seize it, is a simple, radical and workable agenda to end the isolationism of the past. It is for every successful private school and private school foundation to sponsor an academy or academies, and transform themselves into state-private school federations. The arguments of principle are manifold and manifest. We will never build a one nation society unless we eradicate failing schools and systematically leverage our most powerful social leaders and our best educational institutions in the service of the wider community. That means many more good schools, replacing underperforming comprehensives community by community. Academies – independent state schools – are now proven as the successful institutional means of harnessing our most powerful social leaders and best educational institutions in the management of new schools. So we need many more such academies. Successful private schools ought to be prominent among the sponsors for the next wave of academies. Everything about academies is in the DNA of the successful private school: independence, excellence, innovation, social mission. And the benefit is not only to the wider community, it is also to the private schools themselves, whose mission is enlarged, whose relative isolation is ended, and whose social engagement, beyond the families of the better-off, is transformed. Let me deal with some of the concerns. To those on the Left, and in the state and academy sectors, who see private schools as an irrelevance, I hope I have said enough about their huge footprint in almost every national elite to show why the isolationism of the past cannot continue if opportunity is to be for the many not the few. To those in the private schools, and their governing bodies, who are reluctant to embrace academies, I appeal both to their professionalism and to their moral and charitable missions. It was excusable to stand apart from state-funded education when the state and its leaders did not want you engaged in the first place. But that is the isolationist politics of the past. The politics of the present and the future is that the nation seeks your engagement in setting up new independent state-funded academies in a way which does not compromise your independence, and which renews for the 21st century your essential moral and charitable purposes. Let me say a few more words about these charitable purposes. William of Wykeham established Winchester for the education mainly of poor scholars, and only a minority of “noble commoners”. Henry VI set up Eton for poor scholars. Charterhouse was established by Sir Thomas Sutton, the wealthiest commoner in England, for – yes, more poor scholars. Elizabeth I endowed Westminster School for the same purpose; to this day it is an integral part of Westminster Abbey, its governing body chaired by the Dean of Westminster appointed by The Queen. John Lyon set up Harrow in 1572 as a free grammar school for the education of boys of the parish of Harrow, and the parish objected strongly when the Endowed Schools Act removed this obligation. I could go on and on, but you get the gist. The governors of these great educational charities should look honestly to their charitable purposes. If they do, I believe it is hard for them to conclude that a few more bursaries here and there are enough, when they could be running new schools serving the very missions for which their assets were intended in the first place. Lords, and former Minister, William Waldegrave. Its members include three professors, three knights, five PhDs, and the former Private Secretary to the Prince of Wales. The Dean of Westminster, who chairs Westminster School’s Governing Body, is my good friend John Hall, the former chief education officer of the Church of England, who was the driving force behind the C of E’s decision to set up more than 30 academies. His fellow governors include the Dean of Christ Church, Oxford, the Master of Trinity College, Cambridge, two professors, two canons, two knights, one baron and one dame. Every public school governing body in the country is a catalogue of the very great and the very good, including eminent business and educational leaders. The idea that these organisations, if they have the will to do so, cannot command the resources and the expertise needed to run a successful school or schools in less advantaged areas – well, if that were true, then England would indeed be Greece, about to default on its whole society not just its government borrowing. But there is no need to argue only by assertion. Just look at those who are taking a lead, and see the movement for change which is gathering pace. Dulwich is successfully sponsoring an academy in Sheppey. Wellington is successfully sponsoring an academy in Wiltshire. The King Edward VI Foundation is successfully sponsoring an academy in Birmingham, alongside its two private schools and five state grammar schools. All of these academies replace failing comprehensives. The Girls Day School Trust has converted two of its outstanding private schools, in Liverpool and Birkenhead, into state academies. Three of the most impressive academy chains – built up by the Mercers Company, the Haberdashers Company, and the City of London Corporation – have grown out of the management of historic private schools, leveraging this educational expertise and experience to establish chains of academies alongside. The City Corporation, historic sponsors of the City of London Schools for Boys and Girls, and the Guildhall School of Music and Drama, now sponsors three academies in its neighbouring boroughs on Islington, Southwark and Hackney. David Levin, the headmaster of the City of London School for Boys, and this year’s Chairman of the Headmasters’ Conference, in a highly constructive speech last week in Guildhall, suggested that fellow HMC schools might start sponsoring primary-level academies. I welcome this, but why stop at primary academies? HMC schools are secondary schools; it is secondary education they know best and where they can make most difference. Never go for the smaller reform option simply because it is smaller, is another of my maxims. The Mercers, historic managers of St Paul’s Girls and St Paul’s Boys Schools, now sponsor an academy nearby in West London, and a chain of academies growing out of the Mercers’ outstandingly successful Thomas Telford School – one of the original City Technology Colleges – in Telford. The Haberdashers, with their historic private schools in Elstree and Monmouth, now have two clusters of successful academies, one in Lewisham and the other in Telford. A fortnight ago I spoke at the Haberdashers’ Annual Education Dinner in their magnificent new livery company hall next to Barts, alongside the Earl of Wessex, a Haberdasher. The heads and many of the governors and staff of the Haberdashers academies and the private schools were there, discussing their work together and their plans for the future. Each year all new pupils from all the schools visit Haberdashers Hall. For an eleven year old, it must be a truly awe-inspiring experience. A month ago I was at Wellington Academy in Wiltshire, speaking alongside Anthony Seldon, the Master of Wellington College, at a joint conference of the staff of both Wellington College and Wellington Academy. The academy has a boarding house, a Combined Cadet Force, an emphasis on service, academic excellence and holistic development, all traits of Wellington College. Anthony told the story of how Wellington came to take on the academy project. Wellington College was founded in the 1850s as the memorial for the Duke of Wellington, to provide free education for military orphans in the wake of the Crimean War. The school is proud of its traditions and to this day offers fee support for children who have lost parents in the service of their country. But they are now only a small proportion of the intake. The governors of the college decided to sponsor an academy to strengthen this original social mission. They deliberately took over a failing school in Tidworth, close to the Tidworth military garrison on Salisbury Plain, to reflect the college’s traditions and expertise. The academy takes up to half its pupils from military families. High levels of mobility are an obvious fact of life for children in military families, so the boarding option is particularly important. With vision and leadership, there could be hundreds more academies sponsored by private school foundations, changing the face of education in this country for the better. Now is the time to act. While I was helping to pioneer academies, two pieces of historic wisdom often came to mind. The first was Machiavelli. “It must be remembered that there is nothing more difficult to plan, more doubtful of success, nor more dangerous to manage than the creation of a new system,” he famously wrote.“For the initiator has the enmity of all who would profit by the preservation of the old institutions and merely lukewarm defenders in those who should gain by the new ones.” He must have been writing about the reform of English education, I used to think. Fortunately, the success of academies is now pretty clear. The new system is there. It just needs to be scaled up. However, equally compelling to me, as a reformer, are Churchill’s words on the opening of the new chamber of the House of Commons in 1950, replacing the one bombed by Hitler. “We mould our institutions and they mould us,” he said. Institutions shape societies, and educational institutions do so perhaps more than any others outside the family. Last Friday I visited the Petchey Academy, one of the five new academies in Hackney. Its sponsor, Jack Petchey, is one of the greatest East End businessmen and philanthropists of recent decades and his academy – hoping to get above the 80 per cent GCSE level in its first GCSE results this year – is inspirational is so many ways. The academy isn’t just about exam results, it is about education for character, for community and for citizenship. They do it brilliantly in one of the most deprived inner-city communities in the country. They were particularly keen I should see their debating teams from Years 10 and 11 debate before the whole of their two year groups. The debaters were articulate and well-prepared, just like in all those private school debating societies. But the motion they were debating was as follows: “This House would abolish the private schools.” It was carried two to one. All the old arguments were there. Unfairness. Privilege. Elitism. Afterwards I asked the girl who had led the charge whether she had ever visited a private school. “Of course not,” she said. “Why would they want to have anything to do with anyone from around here?” Why indeed. It is time to bury the past and build a better future. The education secretary Michael Gove has played his designated role when faced with teacher strikes: he has urged teachers to turn up for work to show their professional commitment on Thursday, as two of the three big unions, the NUT and ATL, strike over pensions, and suggested that schools should defiantly remain open staffed by militant mums. Meanwhile the Labour leader, Ed Miliband, has joined the chorus of criticism over the strikes, recognising that any sign of union support could terminally hurt his already weak leadership ratings. Of course, the strike is a fairly blunt instrument, and has been more used in conference motions than actual pickets by the teaching unions over the years. The NUT rarely manages fewer than half a dozen such threats at its annual Easter shindig. But this time the anger among teachers, as with other public sector workers, seems a lot stronger than usual. The relatively moderate ATL is striking, and even the moderate leadership of the National Association of Head Teachers is tempted to join in, though the second biggest union the NASUWT has so far resisted doing so. The issue is pensions. The typical teacher will have to pay an extra 3.4% a year of their incomes into pensions by 2014, up from 6.4% to as much as 9.8%. At the same time, the retirement age is rising, the value of pensions will fall with a link to the Consumer Prices Index rather than the Retail Prices Index. And, most contentiously for headteachers and school leaders, the value of the pension will be based on average rather than final salary. All of this comes amidst a pay freeze that happens to coincide with significant inflation. As the NUT's attempt to justify its action shows, it makes a powerful combination in teachers' pockets. The change could knock £16,000 a year off the pension of a secondary head and cost an average teacher an extra £1000 a year in pension deductions. Teachers feel that the salary gains made in the Labour years are already being eroded, and that without strike action, their pensions case will not be heard. This government is certainly more sensitive to the unions than the Thatcher government, and Cabinet Office minister Francis Maude has been presenting himself as the Government's union point man. It does seem premature to be having strike action, as some unions have recognised. However, talk of banning strikes in the weekend press seems at odds with Maude's efforts too, and can only increase the tensions on both sides. And the case on pensions may enjoy more public sympathy than ministers expect. Lord Hutton, the former Labour minister whose excellent report on pensions heralded many of these changes, has warned of the dangers of moving too quickly. The problem is that the Government's hurried approach to reform seems particularly inappropriate with pensions. Not all public sector schemes are the same: the teachers' scheme is fully funded whereas the local government scheme could collapse if members withdrew over high contributions. Polling has suggested that teachers don't mind paying a bit more so long as they retain their pension scheme: the problem is less the extra contributions than all the other changes combined. And for heads, the loss of a final salary scheme is a particularly bitter blow. Ministers may not want to signal any retreat before Thursday, but they should be open to looking again at the combined impact of their proposals, and alternative mixes to reach their required savings. Lord Bew's review of Key Stage 2 testing seems to have some sensible proposals today. Capturing a school's achievement over three years was used for Labour's school achievement awards, and is probably a fairer way to measure a primary school's performance: indeed it could allow all primary schools to have their results published, including smaller village schools. Schools can suffer with a poor intake one year, and the smaller the cohort, the greater the danger. His suggestion that composition tests should be marked by teachers is clearly intended to appease the anti-tests lobby. And if any aspect of the tests were to be passed to teachers to mark, this should be it. With other elements of English still externally tested, including reading, speaking, listening, grammar, punctuation and vocabulary, internal assessment of creative writing is not unreasonable. However, there should be strong external moderation if the results are to count in a school's league table score. What Lord Bew seems not to have done, for which we should be grateful, is to suggest the abandonment of testing at the end of primary school. This is his most important finding: testing has opened the secret garden where parents were kept in the dark about how schools are doing, it is significantly improved standards in the 3Rs and it has helped to guard against low expectations, with improvements greatest in many inner city areas like Tower Hamlets. He also seems to have dropped an idea floated by Michael Gove before the election that testing take place at the start of secondary school, rather than the end of primary. While many secondary schools do re-test pupils at the start of Year 7, it would have been unfair to judge primary schools on the basis of such tests, particularly as secondary schools have an incentive in value added measures to lower the starting point of their intakes. The teaching unions may not change their opposition to primary school testing. But Lord Bew - whose expertise has previously been as one of the most incisive historians in Northern Ireland - has produced judicious proposals that the Government ought to accept. Testing is rightly here to stay. It is not easy being Prime Minister, having to keep on top of lots of pesky details across Whitehall. It can also be a major cause of inertia if you strike the wrong balance between strategy and substance: look at Gordon Brown's first year as PM as a lesson in how not to do it. But you can also go to the opposite extreme, and that has been the characteristic of David Cameron's first year in office. He paid little heed to the plans that his old boss Andrew Lansley was concocting at Health, even though they ran directly contrary to his promises to voters, and more importantly they had too many half-baked elements, such as compulsory commissioning for GPs and the effective scrapping of waiting time targets. He was far too busy to notice that Kenneth Clarke at Justice was turning the idea of the Tory party as the voice of law and order on its head, with promises to release rapists and paedophiles quickly so long as they fessed up. And his inattention has led to several other lesser difficulties too, from the scrapping of sports partnerships at the DFE to the sell off of forests at Defra. And two weeks running, this disinterest has tripped him up at Prime Minister's Questions, to the benefit of Ed Miliband. To be fair to Cameron, a big reason why he missed a lot of this lay in his foolish acquiescence to the idea that the Blair government's biggest problem was a surfeit of special advisers, so he left his own policy unit in Downing Street woefully understaffed. That, at least, has been remedied and I suspect a count of SpAds and political policy appointments across Whitehall would rival anything from the previous decade. But there are also suggestions that the Prime Minister has the idea that he should float above the minutiae of Whitehall. And to an extent, he should. Tony Blair was very good at seeing the wood from the trees, and getting to the essence of a problem quickly. But that doesn't mean not being informed about potential pitfalls in his Government's policy: Blair used his PMQs preparation assiduously to update himself on such issues and spent plenty of time on detail when a policy was likely to be controversial. There are signs that the some in Government are realising that details should be addressed before they create a crisis: the decision to widen the grounds for legal aid in future divorce cases to include emotional abuse (Clarke had originally intended to confine it to physical domestic violence) has avoided a certain defeat on the question in the House of Lords and an indefensible aspect of the proposals. Cameron has to show a similar attention to detail across all departments, using his policy unit as an early warning system. Otherwise, he will not just acquire a reputation for U-turns and indecisiveness, he could be seen as not on top of the job. And that's not something that people want in their prime ministers. Michael Gove's speech at the National College conference today looks like being a welcome refocusing of academies policy where it really matters. By promising scores of new primary and secondary sponsor-led academies, he is focusing more effort on the schools in disadvantaged areas that need the help most. Liz Sidwell's work as Schools Commissioner is clearly starting to bear fruit and the many frustrated academy sponsors will be pleased that the core of the programme is finally to be re-energised. Accompanying the academies announcement is a hugely ambitious - very brave, minister, as Sir Humphrey would have set - floor target of 50% of pupils in every secondary school or academy gaining five good GCSEs including English and Maths. I welcome the great importance that Gove gives to floor targets, though ambition is only half the battle. And it is on delivery that there will be doubts. Of course, the 2015 target results will not be known before the next election, though Gove has set himself the challenging task of all secondary schools reaching 40% by 2013, another 407 schools (or perhaps 250 after this year's exams). Nobody is a greater fan of floor targets than I am, but one reason they succeeded was because they were challenging but realistic: if too many schools don't hit these targets, it will be seen as Gove's failure. The National Leaders of Education who will be charged with delivering these ambitions will have their work cut out for them. The primary goals seem more realistic: converting the worst 200 primaries to sponsored academies next year and putting another 500 on a three year warning to improve or be converted. Gove's briefers sneer at the levels of progress achieved under Labour. Just remember that in 1997, after 18 years of Conservative government, 50% of secondary schools - 1600 schools - did not have 30% of their pupils gaining the GCSE goal. Today fewer than 100 are in that category. The reason we made such good progress with floor targets, first introduced in 2000, was because they were ambitious but staged. Last year, Gove declared 35% to be the new target now that virtually all schools had reached 30%. That would have been a reasonable 2012 goal. Now schools which had no date for their 35% target are told that in the 2013 GCSEs they must reach 40%. A school typically needs two years to work with a GCSE cohort to achieve such goals, and adjust their curriculum and teaching. Schools should have been warned of the 2013 target before they developed their 2011-13 GCSE programmes and options. One reason Mossbourne, which Gove cites with some justice, has been so successful is that it was able to start with a completely new intake, and mould them with everything from the excellent Year 7 mini-school environment through the disciplined teaching and learning environment admirably created by Michael Wilshaw. The danger is the too rapid moving of the goalposts will create more frustration than ambition, though it is fair also to say that there are a growing number of schools that have shown the capacity for rapid progress. But there's a related problem. There is clearly a capacity issue in the creation of academies. The sneering briefer was at it elsewhere in the Guardian, saying that 89 sponsor-led schools over two years - by 2012 - (let's remember) was more than Labour created between 2000 and 2008. Come off it. Between 2008 and 2010, Labour was responsible for the opening of nearly 200 secondary or all-through academies, and a lot of the hard graft enabling such progress was done by Andrew Adonis before then. And before 2008, sponsors had to provide money not just support. Labour created the environment for Gove to operate in. Yet between 2010 and 2012, just 89 new sponsor-led secondary academies are apparently promised while around 200 schools may be declared 'failing' on the new 40% target in 2013. The primary goals are rightly ambitious; I wonder if the secondary promise is enough to deal with the fallout from the new targets. The truth is that Gove did take his eye off the ball for too long, diverting huge resources in the DFE to helping outstanding schools convert, an entirely reasonable process that could be achieved in most cases simply with the £25,000 grant provided to them. Legal firms charge around £15,000 to complete the process. Instead of maintaining the pace in deprived areas, the focus was on a numbers game rather than tackling the hard cases. Today's Financial Times story by Chris Cook, on which Gove came so badly unstuck on Today, suggests that the government got its financial sums wrong - this reflects the absurd refusal by officials to road test their figures in real situations, something that seriously endangers moves to any national funding formula. The promise that the outstanding academies would have to help weaker schools is not being treated seriously either, unless the schools themselves are keen for it to happen. Thankfully, this speech suggests that the academies programme is starting to move back on track. Let's hope that Gove's departmental resources are put fully behind these ambitious goals too, rather than duplicating the efforts of well remunerated lawyers. This piece was updated on 16 June to reflect additional reported details. It also appears at the Public Finance blog. Living in a small town after a couple of decades in London brings with it a very different pace of life. But what we have also noticed over the last few years has been a remarkable improvement in the quality of eating out opportunities near to our Keynsham home. Since a Google search currently suggests our town to be a culinary desert, and some of its eateries are ignored by the local Venue guide to Bristol and Bath, it may be helpful for visitors to have some recommendations. * The Old Manor House is the best restaurant in town, on the Bristol Road. Located in an atmospheric 17th century old abbot's house, its cosy bar, excellent brasserie and friendly staff offer as good an evening out as anywhere in Bristol or Bath. The food is consistently of a high standard, with a changing but imaginative menu. With a bottle of wine and three courses plus coffee, expect to pay £35-£40 a head. Sunday lunches are splendid, too. It has monthly mid-week jazz dinners and guestrooms. Booking essential. 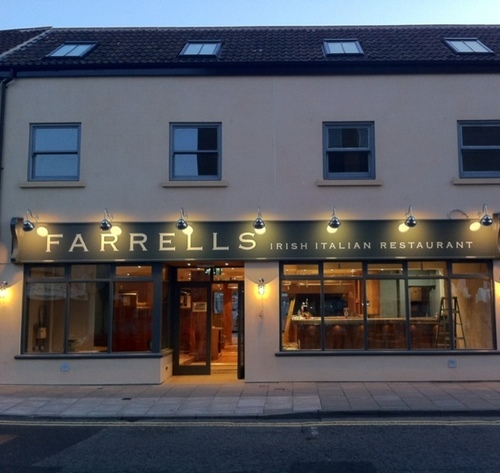 The newest arrival in town is Farrell's, which describes itself as the Irish Italian. Aside from some splashes of Cashel Blue cheese across the menu, and Guinness on tap, the food is largely Italian and the music Irish, a happy mix. The open kitchen and modern decor breathe confidence. 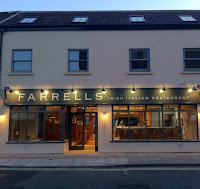 The food is excellent, with good pizzas and pastas, and beautifully cooked steaks. It is ambitious opening such a big new restaurant on a High Street that has suffered too many closures, but it has been very busy in its first weeks and deservedly so. Expect to pay about £20-25 a head for three courses with wine, a bit more for steaks. Tel 0117 986 6330 - booking advisable. * The Ship Inn, on Temple Street, has new management and a great new chef. It is a much nicer place to eat since the smoking ban, and is probably Keynsham's cosiest pub. Great two course Sunday lunches for £10; an excellent evening menu with good value wines; and excellent sandwiches and paninis. Expect to pay £15-£20 for three courses and wine, a little less with £12 specials on Tuesday and Wednesday. Tel: 0117 986 9841 - weekend booking a good idea. * The Wine Bar on the High Street has now taken over the premises of what was Bar One Nine (and some time before The London Inn). It has a modest though interesting selection of good wines and fizz available both by the glass and the bottle, and has a reasonably priced lunch and dinner menu, with steak, Pieminster pies and speciality sausages among the mains. The owner-chef is seeking a home-cooking ambience, and the bar has been given a more intimate makeover which works better than the starker decor of Bar One Nine. There is free wi-fi. Lighting is a bit dim during the day, however. Expect to pay about £20-£25 for three courses and wine. Tel: 0117 914 3153. * The Brassmill, on Avon Mill Lane, though linked to the Village Inns chain, has the feel of a good country pub. Despite its size it is cosy and homely inside. Located in the old Keynsham brassmills (which were an important industry until the 1920s), it has a good and changing menu, an excellent range of great value wines by the glass and no booking. Since it has plenty of space, you can usually get a table at weekends. It is child-friendly though is no longer the ghastly 'family pub' that once occupied the site. Expect to pay £20-£25 for three course dinner with wine. Tel 0117 986 7280. 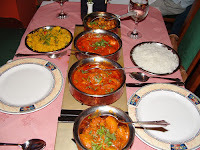 * The Cinnamon restaurant on the high street is a first-rate local Indian restaurant, with great specials and friendly staff. It is hugely popular locally, particularly at weekends, when booking is essential. Expect to pay £20 a head including beer, a little more with wine. The Government will today make some necessary changes to the disaster that is Andrew Lansley's recipe for NHS reform. But they will also neuter any opportunities for greater efficiencies and fail to do anything to address the forthcoming crisis in waiting times, the result of Lansley's naïve and dismissive distrust of Labour's successful floor targets. The whole thing, as a result, is a complete mess. It is doubtful that primary legislation is really needed to make the changes now planned. It is sensible, as this blog has argued for months, to make GP commissioning voluntary. But it is absurd to turn Monitor from a guardian of fair competition into a cuddly promoter of both competition and collaboration. It can't be both - and do its job. As amended, the accountability mechanisms are in severe danger of embedding huge conflicts of interest. But, as today's Populus poll for the Times shows, the public's big concerns are not addressed. Waiting time targets - like floor standards in schools - are an essential guarantor of minimum patient requirements. Ben Goldacre in Saturday's Guardian showed how excessive A and E waits cost lives: for many, that experience is a key part of how they will judge the NHS too. Moving from 18 month to 18 week maximum waits for treatment was one of Labour's great successes. These absolute figures are getting worse (regardless of median waits) and will continue to worsen unless languid Lansley indicates that he cares about them. Together with the quality of care people receive in hospital, these are the issues people care about most and unless ministers get them right, their reforms, such as they are, will be judged a failure. That is not to say that structural issues don't matter. GP commissioning, with willing participants, and private or voluntary providers can improve efficiency; but so can a strong NICE and a willingness to move from general to specialist hospitals, both cynically opposed by Lansley in opposition. By failing to grasp such nettles, and focusing on surprise but ill-thought through reforms, the health secretary has set back NHS reform by at least a decade. And by being asleep on the job as he was doing so, David Cameron and Nick Clegg must take the blame too. Today's report from the Public Accounts Committee simply confirms a picture that had become increasingly apparent in the calculations surrounding the Government's new higher education fees and loans regime. They got their sums wrong. And, as I have argued before, they need to do a number of things to extricate themselves from their arithmetical error. First, they should revisit the balance between teaching grants and fee income. If it is the case that it is costing as much to subsidise loans for fees on some courses as if a higher teaching grant were paid, there should be a rebalancing as part of a deal with universities on fees for lower cost courses. It is an odd sense of priorities that the state subsidises students' drinking budgets away from home but declines to pay a penny towards the costs of teaching them. Second, they should look again at how the UK is being sold to overseas students. Their clampdown on bogus visas is being confused abroad with a clampdown on legitimate students. UK universities and colleges need the income from overseas students to keep fees lower for domestic students. No 10 should take ownership of the visa policy and not allow it to be dictated by zealots in the Home Office who do not have Britain's best economic interests at the forefront of their priorities. Third, they should ensure that competition is genuinely allowed to thrive in higher education. Not of the £18,000 a year Oxbridge-by-Thames celebrity gimmick kind, but strong FE degree courses and good value for money private degree colleges fully accredited. The forthcoming White Paper needs to ensure a genuinely level playing field and stop universities intimidating FE colleges from charging less for degrees. There should be real encouragement for two year courses (minus the endless holidays) and packages that enable students to study close to home. And finally, instead of the Government subsidising loans above £6000 fees automatically, universities that wish to charge more should have to provide the loans themselves and pool the risk. Such a scheme would force universities to think more carefully about the balance of fees and loans, something they have no need to consider at the moment. The Government has blundered its way through its higher education reforms to date (a common coalition affliction) but it has the chance to recover if it looks again at the balance of risks and income. Failure to do so could cause a major crisis in higher education funding when the new regime starts in earnest. Last week the Government unveiled its new Admissions Code with further fanfare about its supposedly revolutionary potential. There are a few useful changes, and the odd perverse one. It makes sense to combine a permissive attitude to the expansion of good schools with the opportunity for academies and free schools to prioritise pupils on free school meals (though why voluntary-aided church schools are excluded is not explained). The Schools Adjudicator may not be able to investigate concerns off his own bat, but will now cover Academies and must respond to complaints from anybody, not just other admissions authorities. Oddly, area-wide lotteries are banned, though banding stays and schools may run their own independently-supervised lotteries; again, a change lacking logic but seemingly based on one study of the Brighton experience, which was in reality as much about addressing middle class grievances as reducing social segregation. Parents have a bit longer to appeal against admissions offers and teaching staff can be prioritised in school admissions policies even where there are no shortages. What is remarkable about the code, besides the admirable sub-editing job performed on its overlong predecessors, is how much it retains of that which Labour introduced. In reality, most school admissions will continue to place priority on distance and siblings, while new selection is still outlawed, and the coalition must hope that enough free schools are established and that the improvements of the last decade continue apace so that dissatisfaction in urban areas with admissions is reduced. But of more importance to their stated priorities is the extent to which the new Code linked with the pupil premium, school structural reforms and changes to accountability combine to improve social mobility. And, on that, the jury is still out. The rhetoric has certainly been bracing, and the Government's media cheerleaders have become over-excited at the pace of academy conversions. But there are a number of important issues that need to be addressed if the rhetoric is to affect reality on the ground. First, the pupil premium is too low this year at £430 per pupil to make much difference, especially as schools are coming to terms with other budget cuts. The premium should reach £1600 by 2014-15 and may then have a bigger impact, but a lot will depend on how schools are held accountable for its results. The league tables may include measures of achievement and progress for poorer pupils, but it will be the value attached to such measures in the Ofsted inspection framework that matter most: the new league table measures will not greatly affect parental choices in themselves. Second, the structural reforms are certainly a victory for advocates of greater independence and diversity - I would certainly count myself as one. But with a few admirable exceptions, most of the 40 planned free schools will do little for the poorest students, however much they satisfy middle class or religious parental aspirations. And most converter academies are converting so for financial reasons. There is little sign that the DFE is using Michael Gove's initial commitment to ensuring strong system leadership from the new academies, within funding agreements for example. Meanwhile, the Government has diverted time and effort to the legal process of academy conversion from the far tougher job of turning around failing schools, even though the £25,000 grant available to converters should cover their legal costs. It insults the intelligence to pretend that the hard grind needed to turn around or replace failing schools is comparable to the fairly simple, financially persuasive and legal process required for successful schools, and without the same drive that Andrew Adonis brought to sponsor-led reform, there will not be the gains that were made by Tony Blair's Academies. Liz Sidwell is making a good start as Schools Commissioner, but the DFE effort as a whole needs to focus on the hard rather than the easy wins. Inputs are not the same as outcomes. And finally, the changes to the Admissions Code are, understandably, permissive. But the pupil premium offers a chance to use some leverage. Prioritising poorer pupils in successful schools could be one of a menu of possibilities linked to a higher premium in the future. As could becoming a National Leader of Education, or successful curriculum innovation. But without some conditionality, the pupil premium is in danger of being a damp squib. Unless it does so, the Treasury will start to question the value for money in continuing to raise the level of the premium at a time of austerity. The coalition has made a lot of noise about social mobility. It has ostensibly put some money where its mouth is, with the pupil premium. But it has not - as yet - joined the dots of its various policies to ensure that it makes the impact it says it wants to see in the results achieved by the poorest pupils. It must start to do so.